Completed in 1990, One Waterfront Towers are two twin towers that sit on 2.45 acres in the Kaka’ako neighborhood of downtown Honolulu at 415 & 425 South street between Auahi and Pohukaina streets. Rising upwards 400 feet the realization of developer Bruce Stark’s grand vision to create Hi-rise luxury condominium living, One Waterfront Towers continues to dominate the downtown waterfront skyline with the timeless beauty and sophistication of Design Architect Boone & Boone. Many residents, guests, and visitors from land and sea all agree, One Waterfront Towers is truly a local landmark that defines elegance! Benefiting from possibly the best location in the Kaka’ako neighborhood, One Waterfront Towers has easy access to both Ala Moana Blvd and Nimitz Highway. 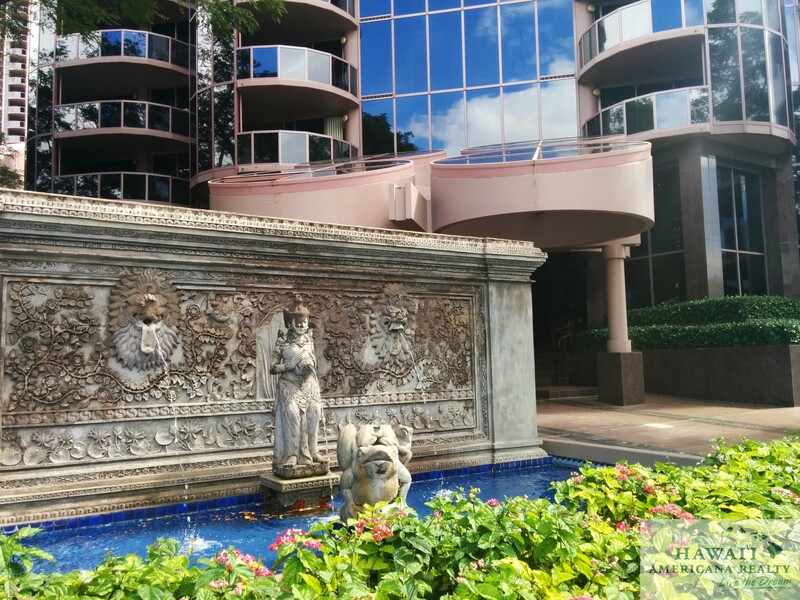 For anyone working in the Downtown area of Honolulu, a commute is only minutes by walking, and both Waikiki and Ala Moana Shopping Center are a only a few minutes by car. 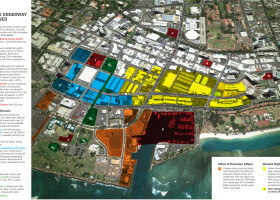 In the near future Kaka’ako will feature Wholefoods, along with dozens of dining and entertainment options that already exist. The recently upgraded patio and entertainment deck of One Waterfront Towers features tremendous views for relaxing by the ‘saltwater’ pool, plus modern cabanas and BBQ’s for entertaining. Scheduled exercise classes area also available. A modernization program has been completed to update the multiple elevators to save residents time, and One Waterfront Towers will be one of the properties to benefit from a proposed Seawater Air Conditioning system. One Waterfront Towers are identical 45-story condominium towers located across from restaurant row. These unique towers were designed by a Japanese architect with tinted glass panels arranged into geometric tubular forms. One Waterfront Towers are mixed leasehold and fee simple with the lease expiring in 2055. Each of the one and two-bedroom homes features central air conditioning. Building amenities include pool, spa, sauna, fitness center, tennis courts and recreation area with BBQ grills. Over 40,000 square feet of commercial space located at 419 South street, owned and managed by the World of Life organization. 486 residential parking and 24 guests parking along with bicycle racks. A recently renovated recreation deck (2012) containing a barbeque garden area with 3 natural gas grills and 4 gazebos, 5 natural gas grilling stations on the deck perimeter, two state of the art Premier Tennis Courts, and a pool deck consisting of a heated pool and jacuzzi spa, a pool cabana area with a complete kitchen, tables, chairs, and chaise lounge chairs. Exercise Room with teadmill, eliptical walker, rowing machine, weight machine, sauna, and men’s and women’s shower facility. Conference room available daily from 8:00 am until 10:00 pm. Car wash area with coin operated vacuum. Free expanded cable TV and high speed internet in each unit.